Let me tell you why I praise and continue to encourage all E46 M3 owners to treat their S54 engine with the Liqui Moly MoS2 Anti Friction lubricant. To put it simply, it greatly extends the life of your rod bearings, which is a costly procedure to replace. And this oil treatment works. Oil sample analysis results will show that it is extremely effective. The patented liquid additive formulated by Liqui Moly, also known as Molybdenum-Disulfide, greatly reduces friction and wear that occurs every time you drive your car. Liqui Moly MoS2 is suitable for all petrol, diesel and LPG engines, safe and effective for all turbocharged and supercharged engines. Simply add with your engine oil. One 300ml bottle can treat during one oil change cycle. The connecting rod bearings installed in M3 coupe/convertible vehicles produced from February 2001 through May 2003 were not manufactured to BMW quality standards. As a result, the connecting rodbearings are susceptible to overheating and subsequent premature failure if vehicles are driven at higher engine speeds over an extended timeframe. This condition will cause a total engine failure. A Service Action will be conducted on those vehicles to replace the connecting rod bearings. Additionally, the engine control module will be programmed with the latest software. Customers will be mailed letters notifying them of the Service Action shortly (copy of letter, Q & A list are attached). The M3 vehicles produced from October 2001 through February 2002, which already had the Connecting Rod Bearings/Oil Pump Campaign 356 (SIB11 02 03) previously performed, are also affected by this Service Action. This was a recall by BMW so if you took your car to get this SA performed, they would’ve replaced the connecting rod bearings and reprogrammed the DME control module. Rod bearings are parts that experience normal wear and tear and are recommended to be replaced every 100k miles even after the initial replacement. For those going the aftermarket route, WPC treated stock rod bearings with ARP bolts is a common procedure. Look at the beautiful crank journals below at 165k miles! Rod bearing replacement is an extremely intensive procedure that requires good knowledge of the car. I highly recommend Kevin (Kaiv on m3forum). Rod bearing replacement is not for the faint of heart. I highly recommend Kevin (Kaiv on m3forum). Once you’ve replaced your rod bearings, this is where the Liqui Moly agent comes into play. Since rod bearing wear is still a concern, it is highly recommended to treat with MoS2 to decrease friction and metallic wear. 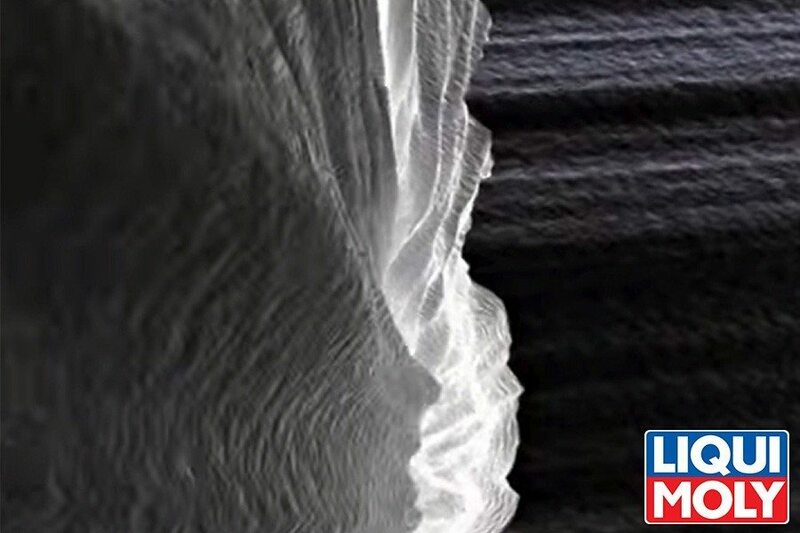 Although metal surfaces may appear polished and smooth, under a microscope you can see all the abrasion caused by all the tiny metal contaminants in the engine oil. MoS2 chemical agents will repair the abrasion caused by oil contaminants by chemically bonding to the high points on the damaged metallic surface, therefore reducing further damage. In fact, the recommended WPC treatment for rod bearings uses MoS2 as a medium to embed. Case #1: We recently pulled apart the rod bearings for TR4CKM3‘s E46 M3 to replace with new ones. Huge thanks to Kaiv (Kevin) in San Diego! He was super professional and provided most of the pictures that you see below. 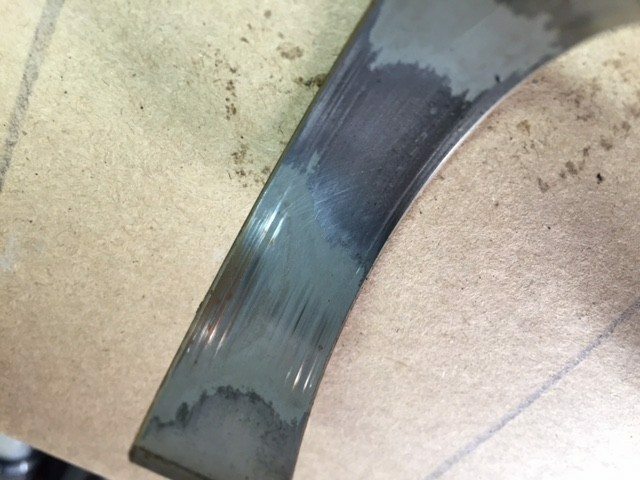 At the time, the rod bearings had roughly 100k miles of wear and the service was performed as preventative maintenance. His engine was treated with Liqui Moly MoS2 for almost the entire life of rod bearings and showed minimal wear. Basically, it wasn’t really necessary at the time to replace even after a few hard track days. 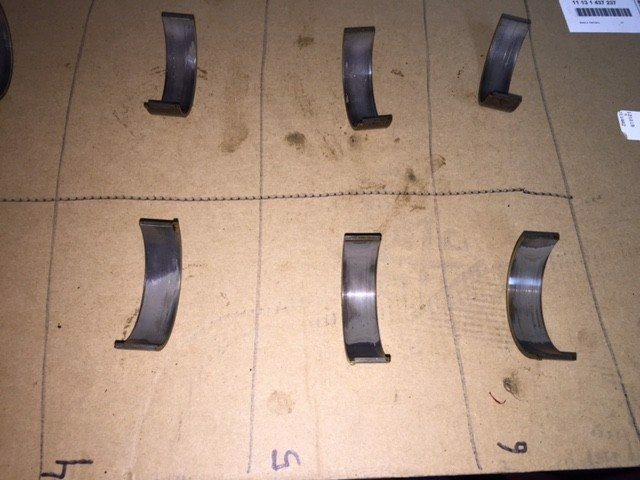 If you need a rod bearing replacement done, please contact Kevin (Kaiv on M3forum.net). He seriously had the best prices in town and knows what he’s doing. Just a tiny bit on the edges. Everything looks good under here. 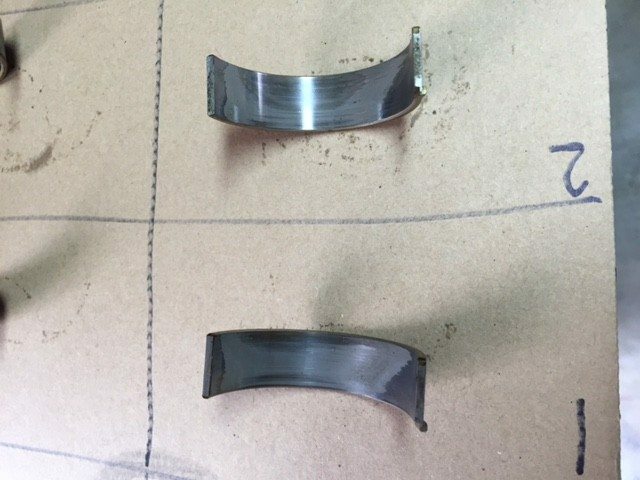 If you need a rod bearing replacement done, please contact Kevin (Kaiv on M3forum.net). He seriously had the best prices in town and was very professional. Case #2: Here is an oil sample analysis for my car which has about 100k miles worth of driving on the bearings. Bearing recall was performed around 40k miles. The first oil sample analysis was done at 140k miles and reports indicated higher than average copper wear which means the rod bearings were wearing. Copper is at 20 compared to an average of 14. Casey at RaceWerkz recommended performing frequent oil changes and to continue monitoring oil samples using Blackstone. I decided to use the MoS2 treatment for every oil change and monitored my oil every other oil change. Post-MoS2 treatment oil analysis showed Copper went back down for both reports! After looking at these reports, I decided to continue treating my bearings with Liqui Moly MoS2 for a couple thousand more miles. Rod bearing maintenance is a very costly procedure, so this little $8 bottle of treatment is a good remedy to keep my wallet (and car) happy for a few more months. Since I’m approaching the 180k miles mark, I’ll be doing the rod bearing replacements very soon. I’ll be going with WPC treated stock rod bearings. Update 11/10/2016: We talked to Liqui Moly representatives and they recommend their newest product Ceratec which has updated technology. Oscar (TR4CKM3) has been using Liqui Moly Ceratec in 30k Miles intervals with good results. He says that Ceratec last longer between oil changes. Liqui Moly MoS2 is something not too many people know about, but should be. Molybdenum-Disulfide is a proven substance that is very effective. Use it to make your E46 M3 happy. It’s under $10 on Amazon.com and definitely worth it. Try it out!